In the IGT business there are no standards and specifications such as in the aero (FAA) and aero-derivative gas turbine world and therefore quality of work performed is strongly dependent on your vendors inspection (written) criteria, (written) repair and coating procedures and their execution. To get proposals that are comparable and to obtain more consistent quality of the repairs at one or more vendors, TEServices has developed bid/repair specifications** for most engine types. Other bid/repair specifications are in development (please let us know if one of these are of interest). These specifications consist of one page per component of all required repair, inspection, coating, and vendor verification steps. All possible options are given at the end of the page. Further process requirements are outlined such as NDT, heat treatment, coating, stripping, etc. These specifications are developed so they can be used for bid request, with or without, the vendors having been able to inspect the components and can be used as quality guideline. 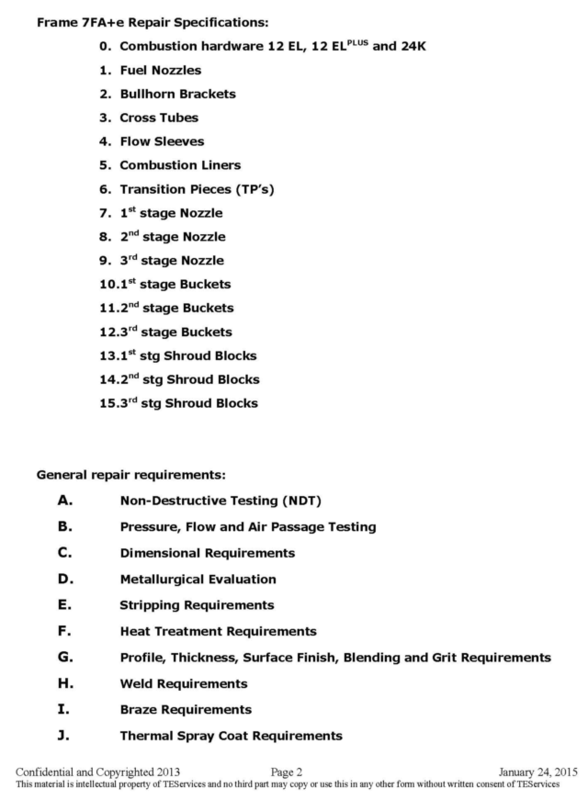 To reiterate since no industry standards for IGT components exist, the second part of these repair/bid specifications are outlined to meet the criteria for inspection (dimensional, NDT, and flow), stripping and coating, repair (weld and braze), heat treatment, and metallurgical evaluation. TEServices can make these specifications available for end-users internal use and their (potential) repair vendors only, while TEServices maintains the copyright**. **Note: TEServices repair specifications are copyrighted and registered at U.S. Copyright Office. By doing so the cost is very reasonable. As more end-users can afford these specifications, vendors are becoming familiar with them, and future up-dates will be made available.